I put my day off of work on Monday to good use and went swimming at Deer Creek Reservoir. 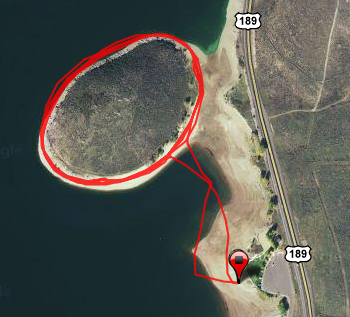 Instead of swimming at my usual spot in Walsburg Bay, home of the Deer Creek Open Water Marathon Swim, I decided to branch out and try swimming at Island Beach. One of the reasons for trying Island Beach is that there is, as you might guess from the name, an island to swim around. I have seen the island from the road every time I have been on my way to Walsburg Bay and have always thought it would be fun to swim around it. Another reason for choosing Island Beach was that my wife and two little boys came with me. Island Beach has a nice little sandy beach that is the perfect spot for little boys to build sand castles and dig holes. The beach also has good views of the southwestern side of the island. It was a beautiful day with sunny skies and water temperatures in the mid 60's. The water seemed to be a little more clear than I remember it being in Walsburg Bay last year. The satellite photo above was obviously taken a few years ago because the reservoir was 100% full and there was enough water between the island and the shore for boats to drive through. I saw more fish that day than I have ever seen at Deer Creek in the past. I'm not a fish expert so I can't say what kind of fish they were but they looked to be redish-brownish in color and were easily over a foot long. I saw "schools" of them swimming around the same spot each time I passed. It was a busy day and I had to be extra careful of boats and wave runners when crossing from the beach to the island and back. The water got a little rougher on the northwestern side of the island, but was fairly calm otherwise. During the fifth lap the wind picked up and I found myself fighting against some pretty rough chop and decided to cut my swim a little short and headed back to the beach. The whole time I was in the water I was thinking about what a great venue Island Beach would make for an open water race. For spectators, the surrounding beaches offer excellent views of the island. If you had a boat you could even cross over to the island and watch from there. Restrooms and concessions are available at the park and at Deer Creek Island Resort. For swimmers it would be fun to race on more of a "track" style course. One lap around the island was about 1/2 mile so it would be easy to tell if you were on pace. It was a great morning of swimming, followed by lunch at Tarahumara (one of the best Mexican restaurants in the State). I will definitely be swimming at Island Beach again. What a great alternative to getting a babysitter and leaving the kids at home. I bet the boys had a ball on the beach watching Dad swim. I have been thinking about trying to put an open water race together and this would be a pretty cool venue for a shorter, 1 mile to 5K, race. US Trisports Adds Awards for Fastest Swim!